The process for this room was fairly simple, it only took us about a week to complete all of the changes. 1. First we removed the machines by lifting them onto large cardboard boxes and scooting them into a nearby room. 2. We took down the shelf and filled in the holes with putty. 3. We took off the shoe moulding and also took up the linoleum floor so that we would easily put down new tile flooring. The tile flooring was the first thing that we did. We used the same tile as in the guest bathroom because we just loved it so much! 1. Before we laid down the mortar we cut all the tiles to make sure everything fit perfectly on the floor. The hardest part was cutting the tiles to fit around the overflow drain (my husband used a special drill bit for cutting circles to do that). 2. Then we mixed the mortar and laid down the tile. Our tiles were made with a built in spacer, so we didn’t use any extra spacers. We wanted a small grout line so that it would look more like actual hardwood flooring. We then had to wait until the next day to do anything else to make sure the mortar set! 3. We mixed the grout according to the package directions & used a grout sponge to apply the grout. We used this really nice bright white non-sanded grout. We immediately gave it wipe down to clean up any excess grout, and then we went back every 20 minutes to do additional cleanings until all of the grout haze was gone from the floor. After the tile floor was finished we decided to install beadboard. I’ve been eyeing beadboard for a while and I was SO EXCITED to finally get to use it! 1. We measured the walls to determine how much beadboard we needed. We bought beadboard panels from Home Depot and had them cut them into smaller pieces in order to fit inside our vehicle. 2. Once we had the beadboard home we had to go back and measure all the spaces on the wall for the light switches and outlets to make sure we cut the exact measurements needed in the beadboard. We used a jigsaw to cut out these square holes. 3. We made sure to dry fit each piece of beadboard before attaching them to the wall. We used Power Grip glue that is applied using a caulk gun to glue each piece onto the wall. Once they were all glued down we also used a nail gun to put nails around the top and bottom of each piece. 4. We also bought a extremely long piece of pre-primed wood moulding to go on top of the beadboard. We took the measurements, cut them, and then nailed each piece to the wall. 5. The next step is really important! We used caulking to fill in all of the nail holes and we also caulked all the edges around the beadboard. At this point we also put back our newly painted white shoe moulding and caulked around that as well. 6. Once the caulk was dry I painted all the moulding and the beadboard a nice white semi-gloss that we’ve also used for all the other mouldings in our home. I applied it using a small roller and also a brush. We decided to install a cabinet and a rod for hanging wet clothing instead of putting the original shelf back on the wall. We bought this cabinet from Lowe’s along with these adorable knobs. We pre-drilled holes in the wall based on where the studs are located, and we also pre-drilled the holes into the cabinet. We then lifted the cabinet up and screwed it into place! We used a cabinet knob/pull template to drill the holes for the new knobs. We also bought a black rod from Lowe’s and cut that down to size to fit in the space between the cabinet and the opposite wall. This rod was really important to me because I needed an area to hang up clothing that was air dry only. We bought the wooden hangers and wall decal from Target. I love that wall decal because it’s just a little bit scandalous! When we put all of the outlet covers back on the wall I realized that none of them were the same bright white as the beadboard, so we took them all back off and I spray painted them and the tops of the screws with a white semi-gloss spray paint. The very last step was putting down the new transition between the tile flooring and the carpet. We bought a pewter transition from Lowe’s and my husband cut it down to size and installed it. We are absolutely delighted with the turn out & we’re thinking about getting frosted doors so we can see the transformation all the time! Thanks!! I think this is one of my favorite projects. I love the wall color! Cheery but also calming…I think cool colors really do work the best in laundry rooms. Also the cabinet + (tension rod?) combo is genius. Thank you! I really do love that color, too! 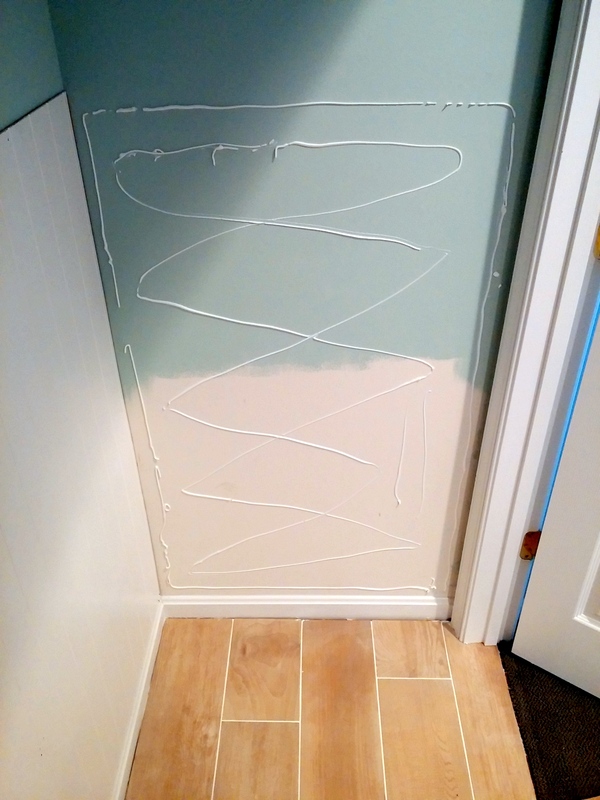 We used it in a bathroom and had enough leftover paint to use it in the laundry room, too, which is always a huge bonus! P.S. For some reason your comment ended up on annabodedotcom.wordpress.com, not annabode.com. Didn’t want you to think I deleted your comment! The link to the original post is here: http://annabode.com/before-after-laundry-room-reveal/. That is so weird! Thank you for redirecting me to to the correct post! I looove this! You seriously need to come over to my house and help a sister out! How has school been thus far!? P.S. I REALLY think your blog is awesome! You and your hubs do an amazing job with that house! Have you ever thought about doing more with your blog? Like branching out and adding an actual Facebook page, sponsoring, ect.. to bring more blog traffic? I think your blog would blow up if you started!!! Hope you are well! Laundry room looks great!! Thank you so much! You are so sweet. You know, I REALLY want to expand my blog and have more people access it, but it just makes me nervous thinking about it! But I think those are great ideas, and I’m going to put them on my goal list! I was totally nervous too, but I took the plunge! You will get it figured out!! Your blog is fantastic no matter what!! I’m doing great! I’m ready to “not” be pregnant anymore!!!! I’m in the home stretch, 33 more days till my due date!!! Omg….. It cannot come quicker!!!! I feel like I have been pregnant FOREVVVERRRR!!!! Anywho, the progress of your home is amazing!! Love watching all the renovations!!!! Can’t wait to see what comes next.